Y’all need a funneh, because it is Spring Forward and Monday and STILL winter. So here you go, courtesy of MrFixIt. 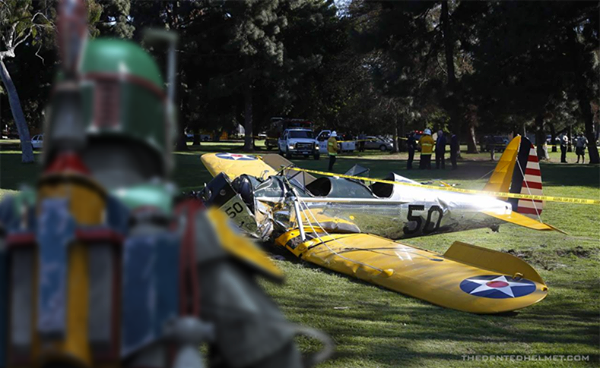 The real reason Harrison Ford crashed. This entry was posted on Monday, March 9th, 2015 at 9:51 AM	and tagged with innocent-fun, sithy-thing and posted in Funnies, Virtualities. You can follow any responses to this entry through the RSS 2.0 feed. No one else was hurt in the accident. Good thing he was flying Solo. Hope someone gave him a han’. That’s no moon. That’s a golf course. If he’d bought a later model, he’d had shields, and a laser cannon. Doctors have advised that he not eat solid food for a while, just to be sure…..everything needs to be a bit Chewy. Seriously, though…what are the odds of him finding a golf course not occupied by Obama?